Lush Fab Glam Inspired Lifestyle For The Modern Woman: Style Your Nursery With 'Layla Grace' Fun Color Cribs and Baby Blankets Sale. Style Your Nursery With 'Layla Grace' Fun Color Cribs and Baby Blankets Sale. Layla Grayce is loved by all including some of Hollywoods finest! Recently, actress and model Molly Sims announced she is turning to Layla Grayce for inspiration to help her decorate and design her baby's nursery and rumor has it she wants to incorporate bright colors. We love the idea of a bright nursery and Newport Cottages has just come out with an adorable collection of cribs featuring fun new colors. If you shop with Layla Grayce now through 4/20 you can receive 15% off baby blankets (excludes Moses Baskets & Pillows) with promo code 15baby. Choose from Stroller Blankets, Play Blankets, Security Blankets, and more. Happy Shopping! 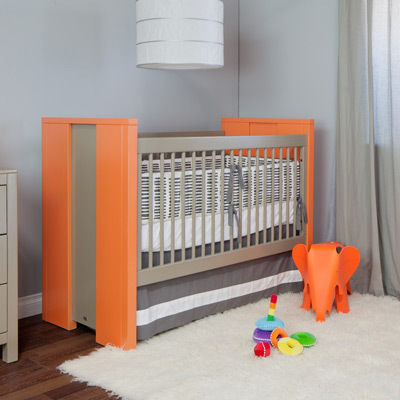 Newport Cottages modern and bright color baby crib. This post brought to you by Layla Grace.